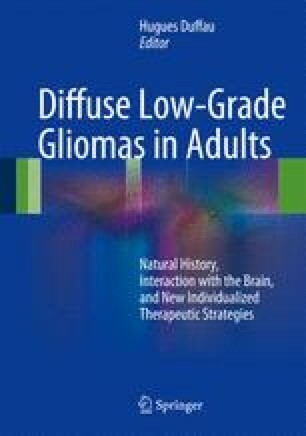 Although diffuse low-grade glioma (DLGG) is a chronic disease of the brain, the vast majority of studies investigated the role of only one specific treatment (e.g., impact of surgery, or impact of radiotherapy, or impact of chemotherapy) without a global view of the whole management. Here, our aim is to switch toward a more holistic concept, based on the anticipation of a personalized and long-term multistage therapeutic approach, with online adaptation of the strategy over years through the feedback provided by clinical, radiological, and pathologico-molecular monitoring at the individual scale. Indeed, we need to elaborate and then to adjust this tailored management during the follow-up, both on the basis of real-time oncological result (control of the glioma) as well as on the basis of functional outcome (preservation or even improvement of quality of life). Thus, we propose new individualized strategies dealing with the chronic interactions between the natural course of the DLGG, the reactional brain plasticity, and the onco-functional modulation elicited by serial treatments.